TD-W8901G 54M Wireless ADSL2+ Router is designed to provide a simple and cost-effective ADSL Internet connection for a private Ethernet or 802.11g/802.11b wireless network. The Router is easy to use. The TD-W8901G connects to an Ethernet LAN or computers via standard Ethernet ports. The ADSL connection is made using ordinary telephone line with standard connectors. Multiple workstations can be networked and connected to the Internet using a single Wide Area Network (WAN) interface and single global IP address. The advanced security enhancements, IP/MAC Filter, Application Filter and URL Filter can help to protect your network from potentially devastating intrusions by malicious agents from the outside of your network. The TD-W8901G supports full-rate ADSL2+ connectivity conforming to the ITU and ANSI specifications. In addition to the basic DMT physical layer functions, the ADSL2+ PHY supports dual latency ADSL2+ framing (fast and interleaved) and the I.432 ATM Physical Layer. 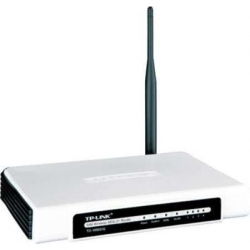 In the most attentive wireless security, the Router provides multiple protection measures. It can be set to turn off the wireless network name (SSID) broadcast so that only stations that have the SSID can be connected. The Router provides wireless LAN 64/128-bit WEP encryption security, WPA-PSK/WPA2-PSK authentication, as well as TKIP/AES encryption security. Various QoS policies enable various application, meeting people's different needs.